The Microsoft Access 2010 version of Total Access Analyzer is now shipping with support for the 32 and 64 bit versions of MS Access 2010. We've added many new features to support Access 2010, generate more useful documentation, identify more errors, and suggest more design improvements and best practices. There's advanced validation of macro commands, macro printouts showing indented syntax, temporary variable cross-referencing and verification, improved query performance analysis, etc. We've also enhanced the user experience with the ability to open a cross-referenced item in design mode while viewing the information, previewing multiple reports at once, and adding color to all reports. Here is a description of the new Access 2010 features. Existing customers can upgrade at a discounted price. FMS President Luke Chung was invited by the governor's office to participate in his proclamation of 2012 as the Year of the Entrepreneur. 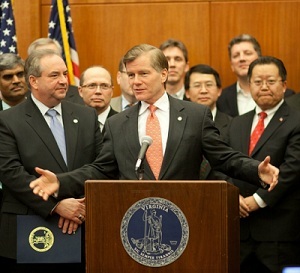 Luke stood behind Governor Bob McDonnell and Lieutenant Governor Bill Bolling during the press conference and participated in a day-long event supporting entrepreneurship, small businesses, and job creation. For more information, read our FMS Participates with Virginia Governor's Declaration of 2012 as the Year of the Entrepreneur. FMS President Luke Chung will be attending and speaking at the three day Microsoft Access conference sponsored by the Portland Oregon Access User Group. Join him and other guest speakers at the beautiful Silver Falls State Park Conference Center. Microsoft speakers include Ryan McMinn, Microsoft Access Senior Program Manager Lead, and Kevin Bell test engineer on the MS Access team. Other speakers include industry authors and notables F. Scott Barker, Alison Balter, Juan Soto, and Armen Stein. Luke will be giving a new presentation on Tips and Techniques for Taking Over and Existing Access Application. For complete details and registration, visit PAUG Conference Site. See photos from last year's conference on our Facebook page. We are pleased to announce the release of Total Access Detective for Microsoft Access 2010 with support for the 32 and 64 bit versions of MS Access 2010. We've also released an X.8 Version update for Microsoft Access 2007 and 2003. Total Access Startup 2010 (Version 14.0) lets you centrally manage and guarantee that all your users always launch the right version of Microsoft Access with the right version of your Access database (MDB, ACCDB, or ADP). Simply distribute a shortcut to your users to start your application. When you post an updated database, your users automatically get it installed on their machine the next time they launch your program. They don't need to know the name of the database. You manage all of that in one place and can change it at any time. A runtime version lets you control the Access version launched for users not on your network. Total Access Startup 2010 supports both 32 and 64 bit versions of Microsoft Access 2010 letting you control which version your application requires. It also supports all legacy versions of Access. Learn more about the new features and try out the free trial version. "Selling a documentation package generated by Total Access Analyzer for your application is a great way to add a training-free, trouble-free and reasonably priced profit center to the work you are already performing!....Total Access Analyzer is a solid product that any Access developer should have in their toolbox; and one that will pay for itself in short order." On September 15th, FMS President Luke Chung was invited by the Senate Finance Committee to share his experiences as a small business owner. As one of 18 participants, Luke was asked about his experience running FMS and how tax policy can hurt and help small businesses thrive and create jobs. In a very bipartisan environment, the staffers of co-chairmen Senator Max Baucus (D-Montana) and Orrin Hatch (R-Utah) listened to the participants who provided a perspective quite different from the deep pocketed lobbyists they normally experience on Capitol Hill. Discover why so many professional developers rely on Total Visual CodeTools to make them more productive. Integrated directly into the Integrated Development Environment (IDE), Total Visual CodeTools offers a rich set of developer tools to help you create, cleanup, and deliver better solutions. The latest version is enhanced for MS Office/Access 2010 and has many new features. Total Visual CodeTools supports all VB6/VBA hosts, including Visual Basic 6.0 (VB6) and Office 2010, 2007, 2003, 2002/XP, and 2000. Check out the photos from the three day Microsoft Access conference sponsored by the Portland Oregon Access User Group. FMS President Luke Chung spoke at the event and had a delightful time in the hills of Silver Falls State Park. Can't wait to attend next year's event! The Enterprise Features web site highlight's FMS President Luke Chung's discussion about why Microsoft Access is underrated and hated in large enterprise organizations. He discusses the dynamics of IT departments in large organizations and their natural conflict with the needs and budgets of information worker. He also shows how organizations that understand the strengths and weaknesses of Microsoft Access can leverage its power for competitive advantage, and how to structure service levels to do so. FMS President Luke Chung will be the guest presenter at the April 5th meeting of the Denver Access User Group. He'll be discussing Microsoft Access 2010, FMS products for Microsoft Access, and all things Access. See you there! Total Access Emailer is the most popular Microsoft Access email program. Running as an add-in, it lets you easily send personalized emails using the information in your database. From using fields in the subject and body of the message, to attaching PDF reports filtered for each recipient, you'll find that Total Access Emailer revolutionizes the way you communicate with your contacts. Any table or query can be the data source for your emails which can be in text or HTML format. We can even automatically include graphics in your HTML emails or let them reference a public site. We are very pleased to announce Total Access Emailer for Access 2010. Enhancements include support for Access 2010, 32 and 64 bit, compressing all your attached files into one zip file with optional password, international extended character support, a new Code Generator, additional programmatic interfaces, and many more new features. An X.6 upgrade version for Access 2007 and earlier versions also available. Download the Free Trial. Learn more about Sentinel Visualizer built on SQL Server. Total Access Admin lets you monitor your databases to see who's currently in it. It's ideal for understanding who's currently connected, compacting databases after everyone has exited it, and troubleshooting multi-user problems. The Total Access Admin 2010 supports Access 2010 and 2007. In addition to supporting 2010, it now lets you monitor multiple databases in one screen. You can perform actions across all the databases, watch the activity in real time, and log the users entering and exiting each database. Visit New Features for complete information. Total Access Admin 2003, version 11.5, is also released for Access 2003 and earlier. Total Access Statistics is the most popular data analysis program for Microsoft Access. It extends the power of Access queries to let you generate a wide range of values such as percentiles, regressions, running totals, correlations, group analysis, etc. Total Access Statistics is now shipping for Microsoft Access 2010. In addition to supporting the 32 and 64 bit versions of Microsoft Access 2010, version 14 offers new financial cash flow analysis to generate net present value (NPV), internal rate of return (IRR), modified IRR (MIRR) for periodic and date dependent investments and receipts. New Features for Access 2010. A new X.8 version is also available for Access 2007, 2003, 2002, and 2000. This is free for customers under a support contract, and is available for a nominal upgrade fee for others. FMS President Luke Chung has written a detailed paper on his expectations of cloud computing and its revolutionary impact on our industry. He considers it the most significant trend since the rise of the Internet in the mid-1990's. The second paper is an example of using SQL Azure with Microsoft Access databases. While much of cloud computing and especially Microsoft Azure is focused on the .NET community, there's much to offer to the Microsoft Access community as well. Follow the detailed step-by-step instructions on linking a Microsoft Access 2007 or 2010 database to tables stored in SQL Azure, Microsoft's SQL Server in the cloud. Then, think about how the ability to create and host enterprise quality databases can impact what is possible for you. We've updated and released a new version of the preview version of Total Access Statistics for Microsoft Access 2010. The original version expired on July 1, but this version is good through September 1. We hope you get a chance to use it and provide feedback on what you discover. Approved by the Board of Supervisors, FMS president Luke Chung will serve on the county's Information Technology Policy Advisory Committee (ITPAC) to advise the county's board and CTO on the future direction of information technology investments. Having served several years on a business and community advisory committee for the superintendent of public schools, Luke is representing the school board on this committee. "It's an honor to serve on this board to help our county and it's 1,000,000+ residents maximize the use of technology to improve services, safety, education, and good governances while minimizing overall costs," said Luke Chung. "Over the years, Fairfax County has established itself as a state and national leader through solid business growth and high quality public education. With constrained budgets, I expect we will continue that tradition through the smart application of technology." We are pleased to release a FREE preview version of Total Access Admin 2010 for your review. Total Access Admin lets you monitor Access databases in real time. Select any Access Jet database (MDB or ACCDB) across your network to view and log users as they enter and exit your database. It's particularly useful for documenting suspect connections that could be the source of database corruption. You can also perform a variety of tasks such as locking new users from opening your database, compacting the database after everyone has exited, etc. The existing version supports Access 2007 and earlier. This new version support Access 2010 for both 32 and 64 bit formats, along with databases from earlier version of MS Access. Total Access Detective makes it easy to find differences between any two Microsoft Access databases or objects. As part of our commitment to quality, we are pleased to release updates of Total Access Detective for our versions for Microsoft Access 2007, 2003, 2003, and 2000. The updates include performance enhancements, Windows 7 support, improved ADP support, and resolve all known issues since their original release. The updates are available free of charge to registered owners who were emailed download instructions for the update. Please contact us if you are a registered owner and did not receive a notification. Total Access Statistics is the world's most popular data analysis program for Microsoft Access. It runs as an Access add-in to let you extend the numerical analysis capabilities of Microsoft Access queries. Total Access Emailer is the world's leading email program for Microsoft Access. It runs as an Access add-in to let you easily create email blasts using your list of email addresses and integrating your data and reports into your messages and attachments. The Professional Version includes a programmatic interface that lets you automate the sending of email blasts through your VBA module code. A simple procedure is provided to let you launch an email blast. Here's a new page describing how to Send Microsoft Access Email Blasts Programmatically using VBA. Total Visual SourceBook is the most extensive professional source code library for Microsoft Access, Office, and Visual Basic 6.0. The latest version includes full support for Access/Office 2007 including the new Access 2007 ACCDB database, Outlook 2007, and many new features to expand the considerable source code library. There are now 194 classes/modules, 100,000+ lines of code, and almost 20,000 lines of example code. As before, you have full control: use our code, learn from it, and enhance it. Best of all, the code is provided royalty free so you can use it in your projects immediately! Written by our staff of Microsoft MVP's, much of this code can't be found anywhere else! FMS President Luke Chung will be giving several presentations on Microsoft Access application development and our products at this conference. Hosted at the University of Queensland, St. Lucia campus, we hope you see him down under! We recently enhanced the query paper to include additional information on the Update Query syntax. Our web site is undergoing major renovations and sports a new look and feel. While portions are still undergoing changes, much of the work is completed and published. We hope you like the enhancements with more improvements to come! With the recently release of the Access 2007 version, we're pleased to provide new versions for Microsoft Access 2003, 2002, and 2000 (versions 11.7, 10.7 and 9.7 respectively). Version X.7 adds many new features including data comparison between two queries, enhanced data comparison options such are comparing two tables when field names are not identical (compare only identical field names or on field order), using the first field as the key field if no key field exists, skipping small numerical data differences, ignoring case differences between modules, improved support for ADP comparisons, etc. Existing customers can upgrade for a nominal fee. FMS is honored that Microsoft has published one of our popular articles on their MSDN global site. Originally published as one of our technical papers on our web site (Error Handling and Debugging Tips and Techniques for Microsoft Access, VBA, and Visual Basic 6 (VB6), Microsoft has now added our paper to their MSDN site. Check it out here. Total Access Statistics is the most powerful data analysis program for Microsoft Access. Extend the power of Access queries with advanced analysis such as percentiles, frequency distributions, moving averages, t-Tests, confidence intervals, ANOVA, data normalization, and much more. Version 12.00.0009 is now available for Access 2007 and includes improved support for ADPs and certain calculations. These updates are available free of charge to registered owners of Total Access Statistics 2007, version 12.0 and Total Access Admin 2007. Notification and download instructions for receiving the patch were emailed to registered owners. If you did not receive instructions, please contact us so we can update your information. Total Access Detective makes it easy to find differences between any two Microsoft Access databases or objects. Know exactly what changed with your properties, fields, indexes, controls, sections, macro lines, VBA module code, and data! List objects in one database and not the other. Find new, deleted, and modified records. Combine records from two tables into a new one. New features include support for Access 2007 and the new ACCDB database format including multi-value fields, enhanced data comparison options, improved support for ADP comparisons, and much more! Microsoft Access databases need to be periodically compacted for optimal performance. You should also perform regular backups. Total Visual Agent performs these system administrative chores, and automates a wide range of Access tasks such as running macros on a schedule. Everything is audited with email notification of problems. Now with full support for Access 2007 and the new ACCDB database format. When we develop custom database applications on the desktop or web, we often store the data in Microsoft SQL Server. Contact our Professional Solutions Group for help with your database development efforts. Whether it's migrating an Access database from Jet to SQL Server or creating a highly scalable web solution using ASP.NET, our team of database experts are here to help. Learn more about our Microsoft SQL Server consulting services. Total Access Admin offers a real-time monitoring of users entering and exiting any Microsoft Access database across your network. An update of Total Access Admin 2007 was just released. All customers were notified of the update via email with download instructions. FMS is well known for our world class Microsoft Access and desktop development skills. Did you also know our Professional Solutions Group is very experienced creating database driven web solutions using Microsoft ASP.NET and SQL Server? We recently updated our information on our Microsoft ASP.NET website development services. Watch videos of Luke Chung's participation on the Microsoft Tech Ed Conference panels. For more information, visit our Upcoming Events page. Hope to see you there! Total Access Components 2007 lets you enhance your applications with amazing visual effects, interactive features, and other features that are sure to amaze your users. Add powerful functionality to your Access application in minutes with the only collection of ActiveX custom controls designed specifically for Microsoft Access. 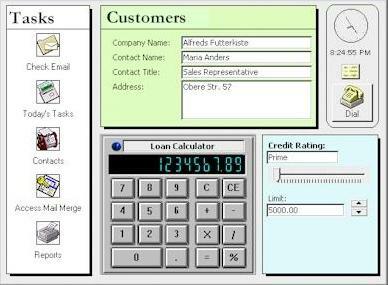 New features include support for Access 2007, a new Cursor control, and enhancements to many controls. Free demo available. Luke Chung is the featured speaker at the March 19th Denver Access User Group meeting held at the Microsoft Office in downtown Denver from 6 to 9 PM. He'll be covering Microsoft Access 2007, the FMS products for Access, and entertain any questions that may arise. The event is free and we encourage you to become member of the group if you aren't already. Microsoft's Dr. Zhiming Xue interviews Luke Chung on topic of dealing with Access database solutions and challenges that project teams deal with when migrating them to more scalable solutions. Watch the video (22 minutes) and read more about Migrating Microsoft Access Databases to SQL Server. FMS is honored to provide custom application design and development work for the headquarters of the US State Department in Washington, DC. The State Department is using our ASP.NET development and SQL Server database expertise to enhance one of their existing public web site which is being converted from legacy ColdFusion and Delphi technologies. An updated version of Total Access Analyzer is now shipping for Access 2003, 2002, and 2000. Many new features were added to help you find more ways to improve your Access databases. Here are the new features. Customers on support contracts receive the upgrade automatically, other customers can upgrade for a nominal fee. If you're used to pasting Excel spreadsheet data into an Access table, you may have encountered this error recently: The data on the Clipboard is damaged, so Microsoft Office Access can't paste it. Maybe you thought there was something wrong with your spreadsheet, data, or memory. It turns out this is caused by a Microsoft Excel 2007 security patch that was released December 9th. Learn about the issue and a few workarounds. Great prizes for competition winners! Read more about this social networking website. Read FMS president Luke Chung's white paper on how to best develop applications and position yourself during these challenging economic times. Balancing budgets, application requirements, and the rapidly changing external environment, a strategy that's quick and nimble is in more demand than ever. Learn how to best position yourself and your organization in these challenging times. Minimize risk and maximize your potential by getting solutions into production quickly and letting the market decide what survives and dies. Application evolution and natural selection is most powerful during times like these. Make sure you anticipate those forces. It's the season for high school seniors to apply to college. This year our Professional Solutions Group is helping Harvard College automate their interview process. Almost every student who applies to be a freshman is offered a personal interview with a local Harvard alum. With over 22,000 applicants last year, it's quite a challenge to match up applicants with interviewers, and manage all the paperwork. Our Professional Solutions Group created a web based solution using SQL Server, Visual Studio .NET, and an Access administrative interface to assist with the process. With Harvard now providing massive scholarships based on financial need (families making under $80K a year don't have to pay anything and those making up to $200K pay only 10%), we expect an even larger pool of applicants. Best wishes to all who apply! The Microsoft Access 2007 version of Total Access Speller is now shipping with many new features. New X.5 versions are also available for Access 2003, 2002, and 2000. Thank you for your patience! The much awaited Microsoft Access 2007 version of Total Access Analyzer is now shipping. Total Access Memo 2007 for Microsoft Access 2007 is now shipping with full support for Access 2007 through Access 2000. Easily add rich text memo fields to your forms and reports tied to your tables. Includes a built-in full screen text editor to let you easily add fonts, point sizes, styles, paragraph settings, graphics, hyperlinks, and more! You can even spell check your formatted text with support for 20 languages. Please join us for a half-day seminar on upsizing Access applications to SQL Server. Watch the televised video of Luke Chung, FMS President, on a panel discussion at the 2008 Microsoft TechEd Conference in Orlando, Florida. Hosted by Microsoft's Mary Chipman, the panel discusses the challenges and approaches of migrating Microsoft Access applications to SQL Server. Total Visual CodeTools 2007 helps you write, cleanup, and deliver better VB6 and VBA code. Discover why so many Access, Office and VB6 developers rely on Total Visual CodeTools to simplify their application development, fix existing and inherited projects, and deliver more robust and supportable solutions. New features include support for Access 2007, detecting unused variables, improved code builders and utilities, and much more. Free demo available. Total Access Startup 2007 is now shipping. Discover how Total Access Startup ensures your users run the latest version of your database with the correct version of Microsoft Access. Centrally manage an unlimited number of Access databases across your network and simplify upgrades between versions. New features include support for Access 2007, launching ADPs, supporting multiple Access versions on the same database, and much more. Press Release. Luke Chung is speaking at the March 19th meeting of the San Diego Access User Group from 6-8PM. FMS is exhibiting at the Microsoft booth at the DoDIIS conference March 16-19th, so stop by if you're there. For details, visit our Upcoming Events page..
Total Access Admin 2007 is now shipping. Discover how Total Access Admin lets you monitor any Access database (Access 97 through 2007) to see all the current user connections. Watch how and when they enter and exit your database in real-time, keep a log file, and troubleshoot problems. You can even set it to compact the database once everyone exits. List of all error numbers and descriptions for Access 2007 plus comparisons with previous Access versions. We've been working with Access 2007 for over a year since the alpha version was released and are delighted by the considerable investment Microsoft made to enhance Access. Rather than simply porting our products to Access 2007 with the same functionality as before, we've invested the time and effort to make sure we take advantage of the new capabilities of Access 2007, added features requested by our customers, and applied the new Office/Access 2007 look and feel. Total Access Statistics for Access 2007 is now shipping with many new features. Enhancements for users of Access 2000, 2002, and 2003 is also available in a new X.7 Version. Additionally, the Total Access Statistics web site is updated with information on the new versions, product PDF fact sheet, new tour, etc. FMS is pleased to release our first product for Microsoft Office Access 2007. Total Access Emailer 2007 is now shipping and introduces several exciting enhancements over the original release, including support for the new ACCDB database format, new field types, new user interface, and the ability to attach Access reports as PDF or XPS files to your emails. FMS receives a General Services Administration (GSA) Schedule Contract to provide software products and consulting services to the US Federal Government. Can't find what you're looking for on Microsoft Access, .NET, SQL Server? Visit our newly updated free links page and utilize the list of outside resources we've put together for your convenience. In an effort to keep you, our customer, up with the latest advances in the industry, we have again updated one of the key white papers regarding Microsoft Access. Learn when to use Microsoft Access and when to use SQL Server in your organization. This newly updated white paper discusses database needs, evolution, and challenges, the advantages, limitations, and myths of Access, and how to use Access and SQL Server strategically in your organization. FMS, Inc. is proud to release new versions of Total Access Analyzer with many new features and enhancements. Version 11.7 is now available for Access 2003, Version 10.7 for Access 2002/XP, and Version 9.7 for Access 2000. Total Access Analyzer is the most popular Microsoft Access add-in winning every industry “Best Access Add-in” award since 1994. The new versions generate even more comprehensive documentation and analysis of Access databases to help help users and developers create better solutions. Learn when to use Microsoft Access and when to use SQL Server in your organization. This white paper discusses database needs, evolution, and challenges, the advantages, limitations, and myths of Access, and how to use Access and SQL Server strategically in your organization. We are excited to announce a new and greatly improved version of Total Access Emailer. Total Access Emailer is the leading email program for Access users and developers. Easily leverage the power of Microsoft Access and email to generate personalized text and HTML email for everyone in your table or query. Use field values from your Access tables and queries to create unique, personalized emails for each recipient. You can even maintain an audit trail to know who was contacted when. Download the trial today. Dot.net magazine of Germany recently recognized Total .NET Analyzer as its Reader's Choice best software for testing, Q/A, and debugging! We are honored by this latest addition to Total .NET Analyzer's wide array of awards and rave reviews. Download a 30-day Trial today and see how this award-winning product can improve your applications. Total Access Statistics is the most powerful data analysis tool for Access. Total Access Statistics runs as an Access add-in and offers a wide range of statistical functions to analyze your data, including regressions, percentiles, ANOVA, t-Tests, and much more. You'll be amazed at the powerful statistical analysis you can generate within Access! Total Access Emailer makes it easy to send personalized emails from within Access. With the release of the new .5 versions for Access 97, 2000, 2002, and 2003, users can now use Total Access Emailer to embed access reports, tables, queries, and more! Microsoft has certified FMS as a Microsoft Small Business Specialist with experience and qualifications to address the needs of small businesses. Find out what we can do for your organization today. While many Access databases remain perfectly fine in Access, a certain number grow and evolve into applications that push the limits of Access. When is it time to grow into SQL Server? Visit the Professional Solutions Group, Upsizing page and discover why even Microsoft uses FMS data to decide when you should use a new solution. As recently featured in Washington Business Journal, the FMS Advanced Systems Group is leading the industry to go beyond traditional link analysis. Visit today and learn more about this exciting advancement in technology. Microsoft has renewed its certification of FMS as a Microsoft Gold Certified Partner. This is Microsoft’s highest partner certification level and reflects the proven experience and expertise of FMS for creating solutions using Microsoft technology. As recently featured in Washington Business Journal, discover this new technology. We are proud to announce that Steve Clark, Senior Project Manager, has been selected for the 5th straight year as a Microsoft Office Systems Access MVP. Each year Microsoft reviews the contributions of professionals around the globe to find the cream of the crop in dedication. In addition to being a consistent resource for Microsoft newsgroups, Steve has also been a contributing author to the Access 2003 VBA Programmer's Reference book published by WROX. The new FMS product catalog is now available. Get to know some of the people that contribute to our success and all the latest products to "Accelerate" your work! The Canadian Information Processing Society has selected FMS to guest speak at the annual conference in Edmonton, Alberta, Canada, November 8th, 2005. We are happy to announce that FMS has moved. Our new address is: 8150 Leesburg Pike, Suite 600, Vienna VA, 22182-2721. Phone, Fax, and Email information remains the same. We enjoy sharing success stories with you. Here are 2 success stories we are proud to highlight. Office Tools Pro uses Total Access Memo and NGP Software, Inc. uses Total Access Agent. Share your experiences with us anytime. We are proud to be in the April issue of Visual Studio magazine, page 19, with a product listing for Total .NET SourceBook - our code library product. All our 2003 products for Microsoft Access are now shipping, which includes the Total Access Ultimate Suite. If you're serious about Access, this suite is what you need for significant productivity! Amaze the boss and save $2000 today! The most popular professional source code library for Access, VB, and VBA developers is now shipping with support for Microsoft Access/Office 2003, as well as Office 2000, Office 2002/XP, and Visual Basic 6. This new version includes browser enhancements to customize the error handling for the FMS procedures making it simple to replace the default error handling code, plus lots of new code. Over 85,000+ lines of code and 160+ classes and modules are available for you to use royalty-free in your applications! The new version of Total Access Analyzer is available and brings new functionality to help Access developers control their databases by understanding how they work. Easily compare objects, properties, fields, controls, lines of code, data, and more to know exactly what changed! New features include combining data differences into a new table, summary reports for databases differences, support for ADPs, and much more! Versions available for Access 2000, 2002, and 2003! We are proud to have our products recognized in the development tools section of MSD2D's Fourth Annual People's Choice Awards. Vote for any of our 3 products: Total .NET Analyzer, Total .NET SourceBook and Total .NET XRef. All Access/Jet databases need regular maintenance for optimal performance and bloat elimination. Total Visual Agent solves your administrative chores like compacts and backups by letting you schedule these and other repetitive tasks. Total Visual Agent can now run as a Windows NT Service which lets you manage ALL your Access/Jet databases across your network securely. Supports all versions of Access (including 2003), Jet, and Visual Basic. Master Microsoft Access, .NET, .ASP, C#, and Visual Basic with this easy-to-follow CD-ROM collection from Blast Through Learning, a company recognized throughout North America for world-class courseware and comprehensive training courses. Industry experts Dan Balter, Paul Sheriff, Alison Balter, and Bruce Jones lead you step by step through the intricacies of using these. We are confident you will find these videos very useful, plus they are nearly 30% off regular price. Order today! The new Total Visual CodeTools is shipping! The new version supports Visual Basic 6, Access/Office 2000, Access 2002/Office XP, and Access/Office 2003. Integrated directly into the VB/VBA Integrated Development Environment, Total Visual CodeTools provides a rich set of coding tools. Total Visual CodeTools helps you increase productivity and ensure that your code is efficient and maintainable. We are proud to announce the new division within FMS, the Advanced Systems Group. This new group is responsible for delivering advanced analytical software to a variety of missions. Visit today! FMS recently exhibited at a MSDN seminar held in Chesapeake, Virginia. The event, attended by over 70 individuals, was a huge success for FMS, who was able to publicize products and services. For information on FMS participation in future MSDN events, as well as other seminars and roundtables, visit our upcoming events page. The most popular Access add-in of all time is now available for Access 2003, plus an updated version 10.5 supporting Access 2002. The new version offers over 200 "Best Practices" to flag errors, offer suggestions, and much more. To get more information on Access Analyzer, view our informational video. Luke Chung, FMS president and founder, discusses software tools that are available to developers. Listen to the recorded radio interview today. The City of Phoenix has chosen FMS to provide operational consulting services and software support to its waste management department. Sentinel Threat Management System has recently been included in Microsoft's Justice and Public Safety catalog. Featured New Database System in Microsoft meeting. FMS delivers association management software for a major custom .NET application to manage memberships, relationships, and events for non-profit university organization headquartered in Washington D.C.
Total Access Statistics for Access 2003 is now shipping with many new features and analysis types. New versions for Access 2000 and 2002 are also available with these enhancements. Sanders Kaufman reviews Total .NET Developer Suite on Builder.com. "The Total .NET Developer Suite looks and feels very much like it is OEM and not a third-party add-in." FMS has received two, 2004 Visual Studio Reader's Choice Merit Awards. Total .NET SourceBook was recognized for Development Tools and Total .NET Analyzer for Performance, Profiling and Debugging Tools. Our entire product line in one catalog. This issue includes the MSDN Universal Subscription for only $1,499 when you purchase any FMS Suite and after the Microsoft DVD rebate - regularly $2,799. Total Access Emailer lets users and developers create and send emails based on their data. Explore this product trial today, FREE! Versions available for Access 97, 2000, 2002, and 2003! 2/13/04 Cast Your Vote Today! The asp.netPRO First Annual Reader's Choice Balloting has begun! FMS is proud to be in the category of Add-in with Total .NET SourceBook and the Utility category with Total .NET Analyzer. Support asp.netPRO and FMS, vote today! In the February 1st issue of SD Times, page 21, article titled "Building On .NET", features our very own Dan Haught. 12/16/03 MSDN Subscriptions - Huge Savings With FMS! Purchase the MSDN Subscription from FMS and receive a $800 discount. And now for a limited time FMS will take an additional $200 off when you purchase the MSDN Subscription with any FMS Product Suite. Buy the Total .NET Developer Suite, Total Access Developer Suite or Total Access Ultimate Suite and pay only $1799 for the MSDN Subscription. That's $1000 in savings! (retail price $2799). Supplies are limited. "Database Evolution: Microsoft Access within an Organization's Database Strategy" Whether you use Access or not, you'll want to read this detailed paper exploring the role of Access (the world's most popular database) in today's rapidly changing IT environment. Written by FMS president Luke Chung, this paper summarizes our experience with the use of Access across enterprise of all sizes. Discover how the strategic and proper use of Access maximizes your ROI and gives your organization a competitive advantage. This paper also analyzes the power of database evolution and how you should embrace and anticipate its impact throughout your organization. In the October issue of Visual Studio Magazine, Total Access Emailer is featured. Maintaining a Competitive Edge: Improving Business Process with the .NET Framework features FMS and client MediVia. Total Access Emailer is highlighted in the product listing section of the October issue of Visual Studio Magazine. Total Access Startup has been approved by Microsoft for quality standards and will now appear with the Microsoft "Designed for Microsoft Windows XP, 2000, ME, 98" logo. Discover this superior product today. Total .NET SourceBook is featured in the Visual Studio Magazine Tool Gallery. Discover this product today. Total Access Startup is featured in 46 Advisor Zone publications including the Microsoft Access Advisor Zone. Use the tool to launch a database with the appropriate version of Access every time. FMS is now a Microsoft Gold Certified Partner, the highest designation for a Microsoft partner, and another example of FMS's commitment to deliver the best Microsoft solutions and services. The German Magazine iX plans to publish a list of tools for Microsoft .NET Framework 1.0/1.1. FMS is proud to announce our entire .NET product line has just been included in this special issue. In the September issue of Access-VB-SQL Advisor Magazine Troy Munford writes "Overcome a Common Access ActiveX Problem, Learn how linking tables at runtime affects ActiveX on forms and reports", page 22. Jim Ferguson writes "Avoid Unwanted Events in VB.NET", page 50. And Dan Haught has the Tip of the Month with "Decompile an Access Database to Improve Performance", page 50. In the September issue of Visual Studio Magazine, page 11, "My favorite category is "Unused," which reveals unused assignments and variables—dead code that invariably winds up lying around once development is complete" said Reviewer Leonard Lobel. "The documentation is clear and thorough, and technical support is courteous and responsive. The tool had difficulty parsing one of my projects, and a friendly representative handled my call. Within a few days, FMS released a new version that fixed the problem." The .NET Developer's Journal is accepting your votes for the 2003 Reader's Choice Awards until August 30th. Our products, Total .NET SourceBook and Total .NET Analyzer have been nominated in a number of categories. We would be grateful if you could take a moment and cast your vote for your favorite FMS .NET tool. As part of our commitment to providing quality software, we have just released an update for Total VB Statistics 6.5. The latest version of Total VB Statistics is 6.5.5. Download it today. As part of our commitment to providing quality software, we have just released an update for Total Access Memo 10 (for Access 2000 & 2002). The latest version of Total Access Memo 2002 is 10.01.0000. Download it today. Total Access Startup is highlighted in the product listing section of the July issue of Visual Studio Magazine. Mike Gunderloy compares three .NET tools and says, "Of the products I’ve looked at here, Total .NET Analyzer takes the most detailed look at code from all angles of best practices." Total .NET Analyzer featured in the Advisor Zone, Visual Basic .NET provides two options for casting. What you need to know to optimize your applications. Access Advisor Update, Issue 2003 Week 24, features Total Access Startup. Use the tool to launch a database with the appropriate version of Access every time. "The SD Times 100 looked for companies which set a direction that developers and the industry followed in 2002" said Alan Zeichick, editor-in-chief of SD Times. "When choosing the SD Times 100, we carefully considered each company's offerings and reputation, as well as the attention and conversion we've heard around the company and its products and technologies, as a sign of leadership within the industry." "I have been a fan of FMS since about 1996 when I found your free 3D text add-in for Access 2.0!! I was in college at the time and found your site to be a fantastic resource for learning about Access. I currently use the Total Access Analyzer for Access 2002 here at work. It's awesome." - Dave Totzke, Andrés Wines Ltd. In the current issue of Advisor Explorer, Total Access Startup is featured in the Technology News section. Visit an incredible forum site for discussion on Microsoft Access, Visual Basic, SQL Server, Office and .NET. The campaign has begun, "FMS has a great history of successfully migrating Access applications over to SQL Server," said Adam Carroll, SQL Server Product Manager at Microsoft. "We knew we wanted a partner with a strong reputation for these service deliveries, so FMS was a natural choice for us." In the current issue, Total Access Admin is featured in the Technology News section. .NET Developer's Journal has listed Total .NET SourceBook as a nomination for their 2003 Reader's Choice Awards. "Developers using Visual Studio .NET 2003 have a dependable resource with FMS," said David Lazar, director for the Developer and Platform Evangelism Division at Microsoft Corp. "Developers using the Total .NET SourceBook for Microsoft .NET will experience greater productivity with a better understanding of the application before deployment." Luke Chung, FMS President, discusses database evolution - Microsoft Access in an organization's database strategy. In the May 2003 issue of Access-VB-SQL Advisor, page 24, FMS's own Steve Clark, Project Manager, discusses how to migrate non-normalized data to a normal form in Access. Total Access Startup is now available! Total Access Startup eases the deployment and management of Microsoft Access databases. With Total Access Startup, you can launch your database with the appropriate version of Access every time. Download the FREE Trial today! In SQL Server Magazine March issue, Total SQL Analyzer PRO is featured as the software that can document and analyze your database performance and detect design problems on page 9. In the Visual Studio Magazine 2003 Buyers Guide & Product Directory, both Total .NET SourceBook & Total .NET XRef are featured on page 28. Total .NET Analyzer is featured on page 37. FMS is also featured as a VSIP partner on page 44. Stephen Swoyer features Total .NET SourcBook in the Enterprise article. The update patch and new trial for Total SQL Statistics are now available. In the March 1st issue of SD Times, page 8, Alan Zeichick announces Total .NET Developer Suite. Buy the suite and save big. In the March issue of Access-VB-SQL Advisor Magazine, page 57, Ken Getz discusses Total Access Speller, an add-in that can help developers catch spelling errors. 2/11/03 Total .NET Developer Suite "Essential Resource"
"FMS is providing Visual Studio .NET 2003 developers with an essential resource," said David Lazar, Director of the Developer and Platform Evangelism Division at Microsoft Corp. "Development teams using the Total .NET Developer Suite will experience greater productivity by identifying application development issues before deployment." Now available, new versions of Total .NET Analyzer, Total .NET SourceBook, and Total .NET XRef! These 1.1 versions fully support the new Visual Studio .NET 2003 (Everett). Download the FREE trial versions today! Order today and receive BOTH, the 1.1 version (2003) and the 1.0 version (2002)! Total Access Admin is now available! Total Access Admin offers total maintenance control of your Access/Jet databases. Simply start the program, point to your database, and take control. In the January 6, 2003 issue, page14, eWeek announces the new FMS Total Access Startup. The new product sets Access database options and enables distributed deployment of applications. More details on this product coming soon. This addition of MSDN Flash announces Total .NET SourceBook in the Products and Technologies section. Omnicom delivers an industry-changing distribution channel for the promotional-products business with Tic Toc Marketplace on the Microsoft site. FMS hires new vice president, Bill Robinette, to take the lead for consulting growth. Access is now the world's leading desktop database solution, used by millions of people worldwide. Microsoft created a 10 year birthday web page for Access. Another Access addition is the MSDN Access Developer Center. We are proud to announce that three of Luke Chung's technical papers were recently published on that site. 10/22/02 Total .NET Analyzer is Now Shipping! Use Total .NET Analyzer to scan all your projects for errors, performance, security and standard issues. Visual Studio Wire announces Total .NET Analyzer. Total .NET Analyzer is featured on the Visual Studio .NET Partner Resources main page. "The FMS Total .NET product line is a valuable resource for Microsoft .NET developers targeting mobile development," said David Rasmussen, lead product manager for .NET mobile developer technologies in the Developer Platform and Evangelism Division at Microsoft Corp. "Microsoft is pleased to be working with FMS to offer customers an easy-to-use computing experience that will enable developers to take advantage of the dedicated resources of Microsoft .NET." .NET Analyzer Checks C#, VB.NET Code by Christina, M. Purpi appears in the Software Development Times, September 15, issue, page 15. In the October issue of Visual Studio Magazine Total SQL Statistics is featured in the Product Listings section, page 21. In the October issue of Visual Studio Magazine Total .NET XRef is presented in the First Looks section, page 19. "One nice feature of XRef is its ability to find any object," said Dianne Siebold. "XRef is useful for speeding up development in enterprise projects." Volume 6, Number 9 announces Total .NET Analyzer in the Products and Technologies section. Now you can join the Microsoft Developer Network at a savings. Subscriptions and renewals are available today. In the New Products section: FMS Releases Total .NET XRef, August issue, page 57. "If you've never been good about coding standards, or your good intentions are sometimes sacrificed when you're working in crunch mode, then you owe it to yourself to check out Total Visual CodeTools, a great set of coding tools" - Danny Lesandrini, August issue, page 17 -18. New product announcement in the August issue, page 52. - "It's entrepreneurship at its best: A company listens to users' complaints about a weakness in a popular program, and then the company provides a solution. That's exactly what FMS, Inc. has done for Microsoft Access database developers with Total Access Speller." - Faithe Wempen, August issue, page 37 - 38. "If you're worried about the spelling on your Access database interface objects, check out FMS Total Access Speller...you'll have no problem figuring out how to use the program." - Crag Bobchin, Contributing Writer. August issue, page 38 - 39. The August issue contains Create a Page Indicator Component on page 18. Rob Mastrostefano is a senior system analyst with FMS and a member of the consulting team that develops custom software solutions. "If you're working on a whole bunch of databases and need help keeping track, this one is for you." Total Access Components for Access 2002 is featured in the June issue of Microsoft Office Solutions Magazine, page 6, in the Toolbox section. Track changes in Access 2002 with Total Access Detective - June 2002 issue. The Windows Developer Magazine, June 2002 issue, announces the entire FMS Total .NET product line. Pinnacle Publishing adds Total .NET XRef to their .NET Developer Store. Total SQL Analyzer PRO - the enhanced version of its predecessor. In the June 2002 issue, section "NEW STUFF, page 11 - FMS rolls out five new developer products for Visual Studio .NET. "The end result is a tool that you can just use, as if it had been built in all along. And after a while you'll wonder how you did without it." Total Visual Agent, Total Access Components, and Total Access Statistics were listed in the "New Products" section of Windows Developer Magazine, May 2002 issue, page 68. "Total Access Analyzer is the most thorough solution for completely documenting Access databases." Creating High-Resolution Times with Total Visual SourceBook. Track changes in Access 2002, as well as discrepancies in different versions of your database. In the May 2002 issue of C/C++ Magazine, Total Visual Agent is announced on page 59, in the "New Products" section. In the April 2002 issue of asp.net PRO Magazine, Designing Commercial Web Services: Part 2, Versioning and Client Support with the .NET Framework on page 52, in the "asp:feature" section. Total .NET XRef - New Software is now available! Cross reference code on demand with Total .NET XRef. "It is blazingly fast...I was completely astonished at the speed of this tool." - Thomas Wagner, eTechPartner, Inc.
"Total Access Analyzer remains one of the most essential add-ins on the market for the serious Access developer." Announces Total SQL Analyzer PRO, Total Access Analyzer, Total Access Detective and Total Visual Agent are all available. Document SQL Server Databases, page 15 & 16 - Total SQL Analyzer. Visualize your C# and VB.NET code. In the "Tool Box" section, page 6. Two new products, Total Access Speller and Total SQL Statistics are featured. The PRO version is now available. Visit and see what's new. Our Access 2002 products are now available, including Total Access Analyzer! Find differences between objects and databases. Great for multi-developer and multi-version environments. Smart Access Reviews Total Access Speller, March 2002 issue. Visual Studio Magazine Reader's Choice Merit Awards for Total VB Statistics - Data Analysis Tool and Total Visual Agent - Middleware and Data Connectivity. "With Total Visual CodeTools, you can slip standards in as part of a productivity tool set - and expect that people will actually conform. Also worth a look if you ever expect to go back and try to maintain your won code. Don't overlook the Help file either - rather than just describing the product, it's also got a long and useful section on VBA best practices." - Mike Gunderloy, Smart Access eXTRA, issue 3.2. "The Total Visual SourceBook is any developer's best friend. The code library alone is worth many times the price of this tool. This tool goes a long way toward promoting reuse and consistency within a development environment." "The thing is, there are many times where code must be used to make one’s application do something different and that is when you will really appreciate the brilliance of Total Visual Sourcebook." "Microsoft, in combination with FMS is delivering an easy-to-use computing experience that will enable customers to take advantage of the next generation of the Web," said David Lazar, group product manager for the Developer and Platform Evangelism Division at Microsoft Corp. "The FMS product line for Microsoft .NET will be an extremely valuable set of products for our mutual customers." It is here! Download this incredible preview version today and put it to work on your Visual Studio .NET projects. Microsoft Online Certified Professional Magazine reviews Total Access Statistics for Access 2002. Smart Access eXTRA issue 3.1. Developers can create applications faster, analyze and cross-reference code, simplify development efforts, and improve the quality of their results with our productivity products. New Support for Access 2002, new code for ASP and more! Total Visual CodeTools for Access 2000/2002 and Visual Basic 6.0 is now available. Designing Commercial Web Services: Part 1, Security and Flexibility with the .NET Framework. You check and re-check and make sure every button works, and every report is complete and understandable. The big day comes. You demo your application to users, or send reports out to the company. And all that people remember is the spelling error that you missed. New Support for 2002! Robust and Professional rich text formatting - Now with full justification of text! Powerful Number Cruncher for SQL Server and .NET Ready! New Support for 2002! The most powerful data analysis program for Microsoft Access. Automate maintenance chores for your Access/Jet databases: Automate backups, compact/repairs, repetitive tasks, and much more. 27 ActiveX controls written specifically for Microsoft Access: supercharge you forms and reports, and simplify programming. "This is one Access utility that's worth the money", said reviewer Danny Lesandrini. On the October 27 radio broadcast of "Let's Talk Computers", Luke Chung, FMS President, discusses changes in the computer industry and the 15 year anniversary of FMS. FMS is selected by Microsoft as a Visual Studio Partner. Entrepreneurs Tour of America. Find out more about the man who started it all, and how FMS was built slowly and carefully over 15 years. No overnight, get rich quick scheme here! You will need a FREE Real Player 8 Basic to hear this radio show interview. In the Gold category of Best Access Add-In - Total Access Analyzer 2000; In the Gold category of Best Access Add-In - Total Access Components 2000; In the Gold category of Best Visual Basic Add-In - Total Visual CodeTools 2000. Total SQL Analyzer Is Now Shipping! The world's first professional documentation and analysis program for Microsoft SQL Server. Now you finally can take control of SQL Server with Total SQL Analyzer. FMS products for Office XP and Access 2002. Total Visual Agent 2000 voted the Readers Choice Award for Best Middleware & Data Connectivity. Our continued efforts to improve are still strongly focused on customer feedback. Please take a minute to compete our new purchase survey and tell us how we are doing. The entire USPS 5-digit zip code database with corresponding city and state names. Includes monthly subscription updates. Enter a zip code and go! Get involved in the community. Do you have a question or need product support? Discuss the solution while you gain knowledge on the FMS Community Newsgroup site. We've improved everything to better communicate with you. On the August 12 radio broadcast of "Let's Talk Computers", Luke Chung, FMS President, discusses FMS and ways to develop Visual Basic applications more efficiently with FMS products. Serious Access developers should get our award-winning products in suite bundles to save time and money! Now available for Access 2000. Visual Basic developers can now get our award-winning products in money saving bundles! Designed for individual developers and development teams, these suites will save you time and headaches! FMS President Luke Chung is now serving as president of the Washington, DC chapter of the Young Entrepreneurs' Organization (YEO). YEO is a global, non-profit, educational organization that helps its 3500+ members build upon their successes through an array of learning and peer-to-peer support opportunities. The only collection of custom controls designed specifically for Access. Easily add new power and functionality to your Access applications. Winner of every Best Access Add-in award since 1994. Total Access Analyzer 2000 is now available. May 2000, MS Office & VBA Developer, pp. 58-59. Only Total Access Memo 2000 gives you the power to add full formatting to your rich text data! Our super-easy data binding means the you can integrate rich-text right into your existing tables. The most powerful data analysis program for Microsoft Access is now available for Access 2000. Perform a wide range of statistical analysis on your databases. Microsoft reports a bug in Access 2000 that they say can be resolved by using FMS' Total Access Memo 2000! According to Microsoft, you cannot see the contents of an embedded Microsoft Rich TextBox ActiveX Control when you Print Preview a report in Access 2000. However, FMS has a RichText control available that does not result in the behavior described in the article. Click here to read about the bug and the solution using Total Access Memo 2000! Total VB SourceBook received another glowing review. This time from Visual Developer magazine. See what the experts are saying about our statistical analysis program for Visual Basic in the May issue of VBPJ or see full text of the article online. Total VB SourceBook, FMS' debut Visual Basic product, is already receiving recognition and awards from the VB community! Total VB SourceBook received the highly coveted Visual Basic Programmer's Journal (VBPJ) Reader's Choice Award. Each year readers of VBPJ -- the leading magazine for Visual Basic® programmers -- select the award-winning products because they’re the most intriguing, innovative, and promise the best value for Visual Basic developers. Take a look at the Ultimate Visual Basic Code Library and Code Repository...Click here! Total Access Detective was reviewed in the March 1999 Denver Access Area User Group Newsletter. Click here for full text of the article! "Total Access Detective is valuable for those times when you have two or more versions or copies of the same database and you are not sure which one is the latest version. This program is a must have for those times when you have two or more people working on the same project, it takes the confusion out of trying to determine which changes or updates are the correct ones." Spring 1999 Buyers Guide, VBPJ, page 68. January 1999, WinPlanet Online Review. November 1998, VBPJ, page 15. August 14, 1998, Visual Programming++. FMS Wins 13 Access-VB-Office Advisor Reader's Choice Awards! Check our our online reviews, and see what the critics are saying about our products.